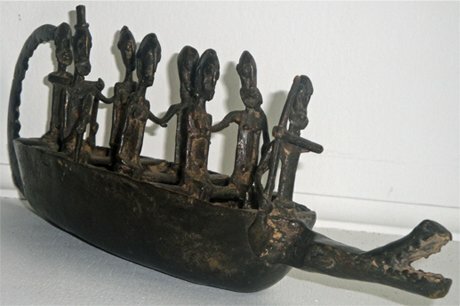 This bronze boat depicts the myth of the ancestors arriving to the Dogon country on the back of a crocodile. This Dogon ancestor crocodile boat was handcrafted in Mali Africa using the 'lost-wax casting' method (See video : http://www.youtube.com/watch?v=REutkpo3ors) which is both an ancient and quite primitive method. The Dogon people live in central Mali (180 miles south of Timbuktu) and are best known for their mythology their mask dances wooden sculptures and architecture. They use ancestal figures to symbolically protect their family and home. Size : 14.5" long 3.5" wide and 4.5" high and weighs approximately 2.2 Lbs. Each African lost-wax casting statue is an "original" work of art individually crafted; no two are exactly alike and the original nature of tribal art will be reflected by variances from the African statues as shown. The statue in the photo is the one you will receive.